When I was in Southern California this summer, I stumbled upon a wonderful interior design studio with a store attached, and this store had the most amazing selection of rocks and minerals for sale (for use as accessories). The stone spheres in particular caught my eye – I love the shape, and they had a huge array of colors and sizes. Since that visit, I have been collecting pictures of spheres that I noticed on Pinterest or in my old interior design image files. I was surprised to note that some of my favorite room images from the past have spheres used as accessories – I had not even noticed! Here is a good example. This picture has been on my blog countless times. 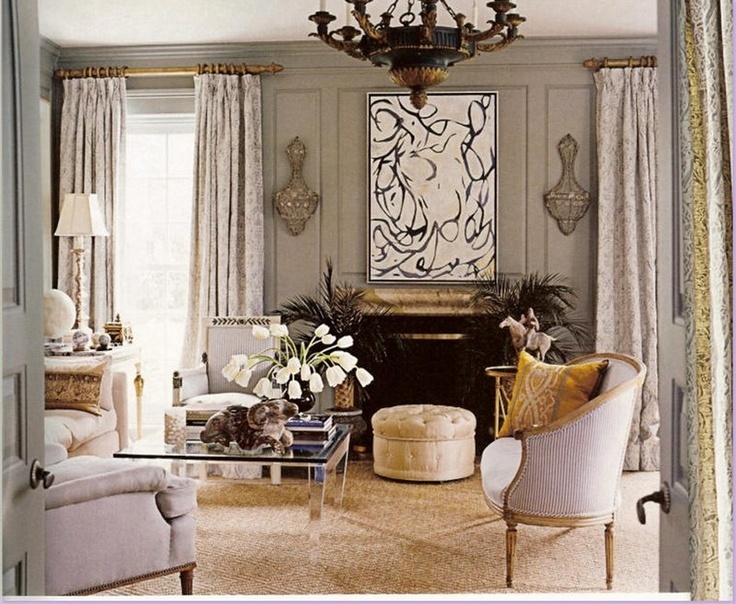 Something about this room has always had great appeal to me – the combination of the sand color of the sisal, the grays of the wall and upholstery, the contemporary art, and the white tulips (my favorite) – it all comes together beautifully. 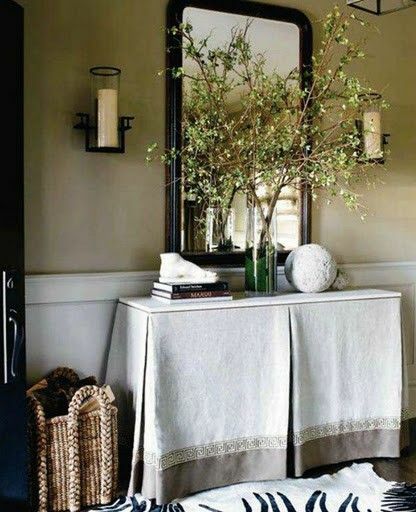 When I looked at this picture with fresh eyes, I spotted the spheres on the side table – one large, and three small. The small ones could be mounted finials. Interior design by Gerrie Bremermann. 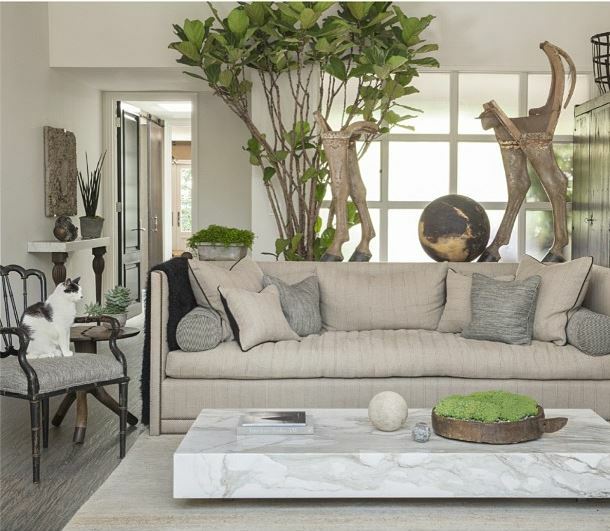 When I opened up this month's Veranda and saw the beautiful house of garden designer Scott Shrader, I noticed the many spheres he uses throughout his house, inside and out. This was my favorite house from the magazine - in no small part because of the calm, beautiful, and balanced interiors. I featured this room on my blog several years ago. I wondered how the designer got all of the mercury glass spheres to stay in place, not knowing about museum wax when I wrote the post! Interior design by Caldwell Flake. 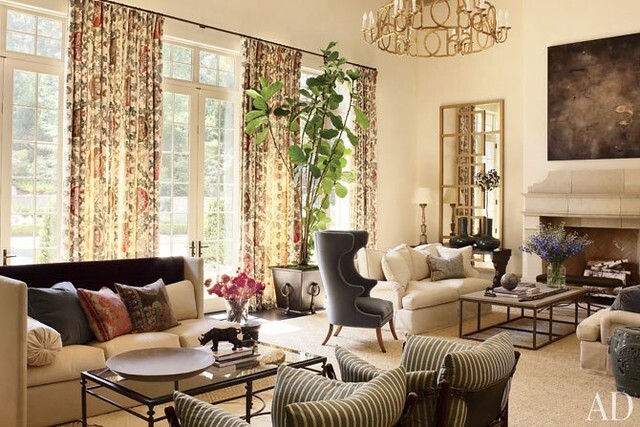 A Suzanne Kasler Interiors designed room, seen in a recent issue of Architectural Digest, is beautifully layered. The sphere on the coffee table caught my eye. Suzanne frequently uses spheres in her accessory design for a room. 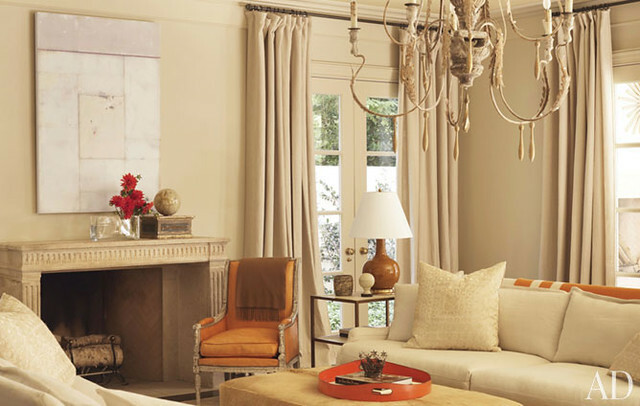 The mantel of Suzanne’s own family room features a stone sphere. 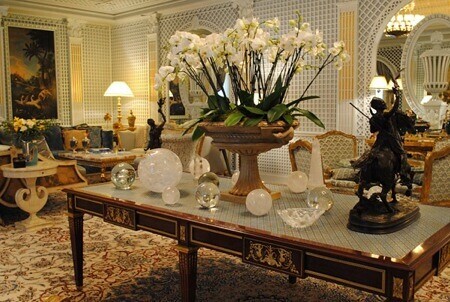 Another Suzanne Kasler design with a grouping of stone spheres on the lower shelf of the console. I think this sphere is part of the lamp; what a beautiful design. Via Elle Décor, interior design by Kevin Roberts. I love the look of a sphere on a bookshelf. I can’t locate the source for this image, but all of the spheres on the table caught my eye. 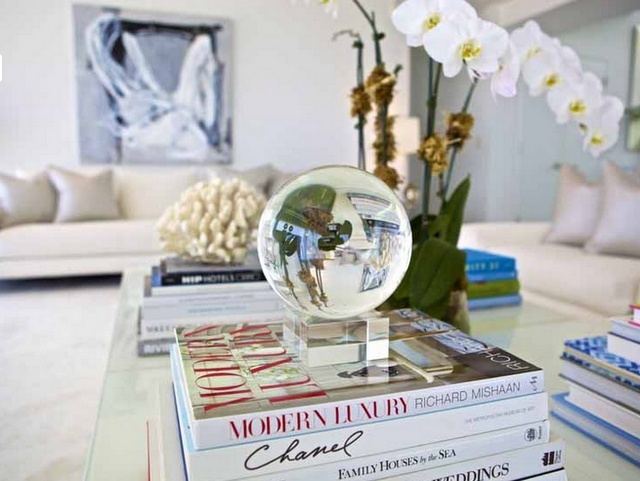 A crystal ball like sphere is a great element of this expertly styled coffee table. Via Bijou and Boheme. A collected group of objects on a table include several spheres, which cleverly repeat the shape of the rounded feet of this Biedermeier table. Via Savvy Home. A more rustic style stone sphere anchors the arrangement on this console. 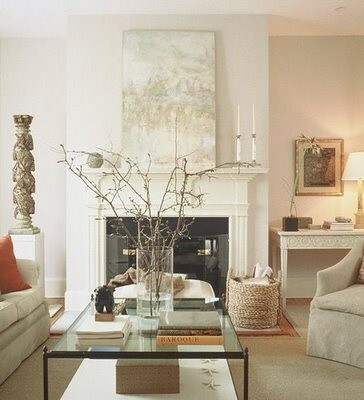 I saved this picture in my old computer files because I liked the composition of the room, the art above the fireplace, and the indoor greenery. But this time around I noticed the sphere on the console, and what appears to be a large sphere on the left side of the room. 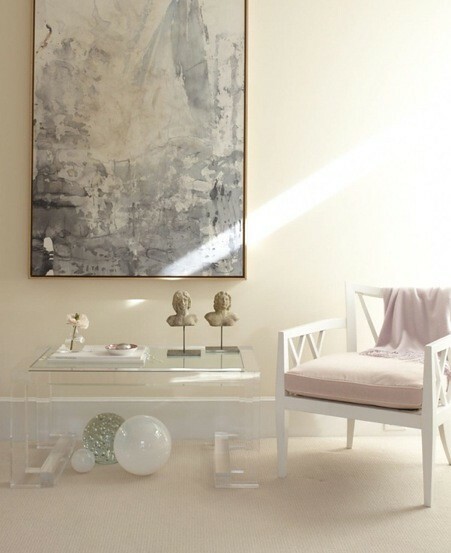 White spheres blend right in with this pastel palette. 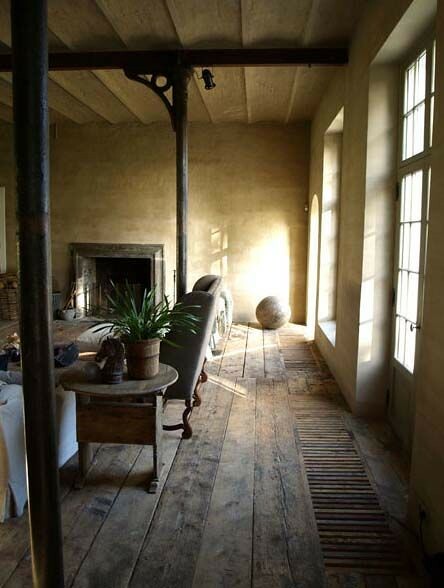 A solidary large scale sphere is the reward at the end of the view in this more rustic style design. 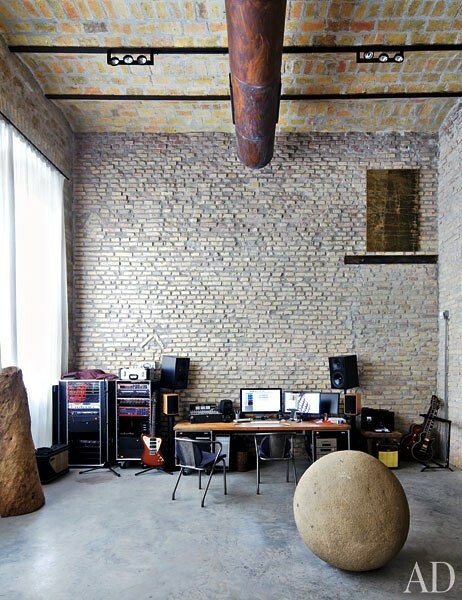 In the recording studio of two concert pianists, a sphere carved by Thai monks is placed by designer Axel Vervoort. Via Architectural Digest. Another favorite place for a sphere is on a mantel. Interior design by Caldwell-Beebe, one of my favorite rooms of theirs. This house was on a tour of homes a few years ago, and I snapped a picture of the landing with its perfectly scaled wing chair (anyone recognize it?) and the three wood spheres that surround it. It’s a striking vignette. One of my favorite Amanda Nisbet designs – there are other versions of this picture without the spheres, but I like the element that they add. 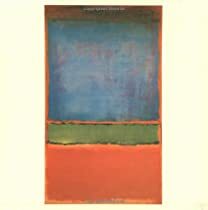 As I was putting the finishing touches on this post, I read an article in the New York Times about the new magazine Milieu, published by Houston based designer Pamela Pierce. One of the designers featured in the premiere issue is Walda Pairon. The work of this designer from Belgium captured my eye. 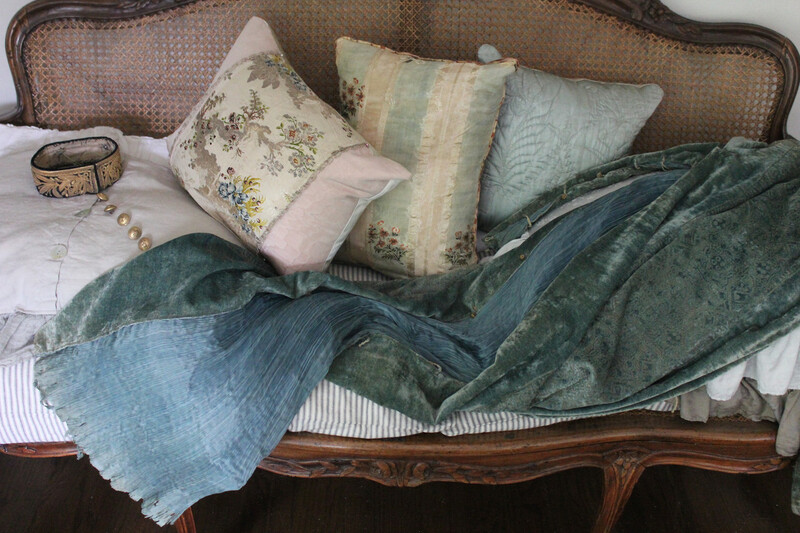 Remodelista had written about her this spring, and this close up of a vignette from Pairon’s living room particularly spoke to me. As Remodelista notes, “Pairon puts great importance on the placement of objects; nothing should be gratuitous”. I think that sums up why spheres have such great appeal to me. 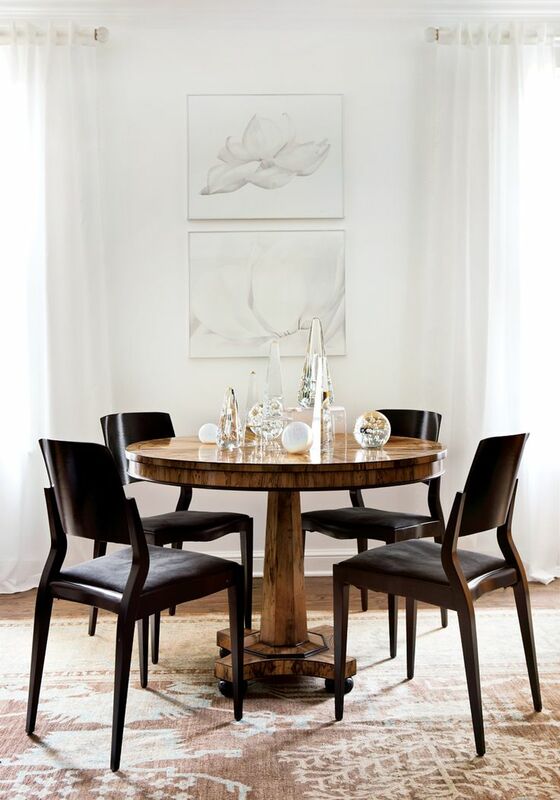 Their placement seems quite deliberate, they have such a calming and balanced effect to a room, and they are often one of my favorite ways to complete a space. Clearly spheres have great appeal to Walda Pairon too – she chose an image of a sphere for the cover of her book Interiors with a Soul (which does not seem to be readily available in the US right now). What do you think of spheres? 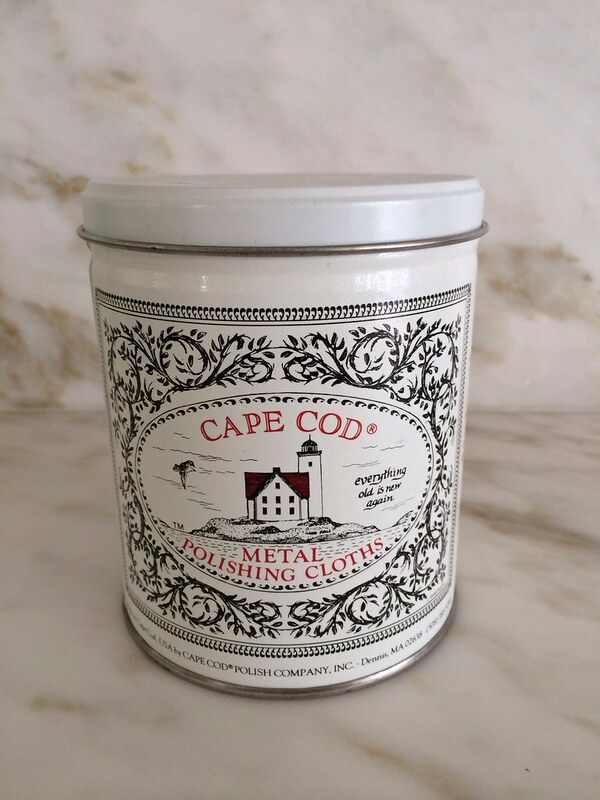 Do you have any in your décor? I bought a beautiful sphere off ebay earlier this year, but I have not found a place for it yet. I am thinking about putting it in a bookshelf, out of the way of curious hands (my kids) and enthusiastic tails (my dog). 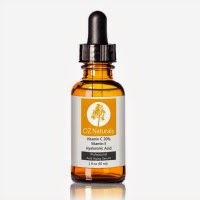 Some of these images came from Pinterest, and the name of the designer was not attached. If the designer is not noted, and you recognize the work, please leave a comment in the post and I will update. Click here to comment. Thanks! I receive so many inquiries from shops, blogs, architects, designers, artists, and home related vendors about advertising opportunities on the blog. Please see my advertising information page for more details on sponsorship opportunities available for the month of September. 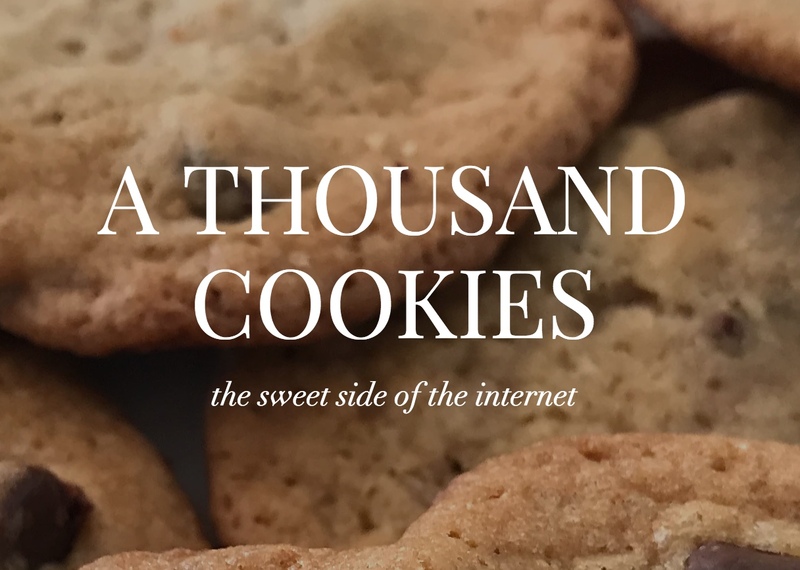 Updated blog header? It's pretty! Great post too. 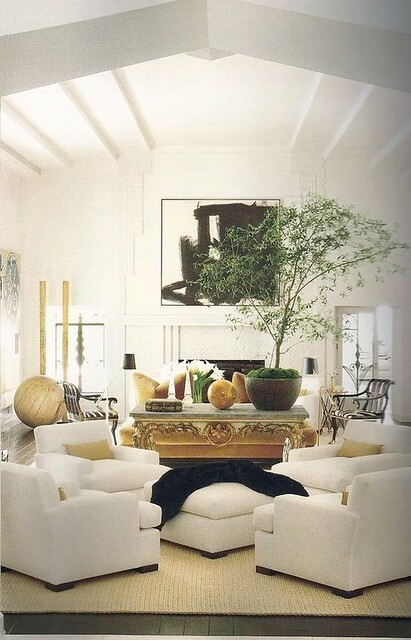 I adore the use of spheres in design as they tend to soften hard edges of furniture and walls. 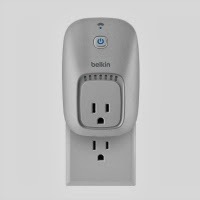 The large ones in a corner or under a table seem to be the perfect piece to fill an otherwise empty space. Currey and Company has ones that I LOVE!! I love the use of spheres through Japanese Fishing Floats throughout the inside (and outside!) of the home on a favorite blog "For the Love of a House." Here is a wonderful vintage iron orb with ivy growing on it in her garden. Now she makes her own using rings from old whiskey barrels. Here are her instructions. 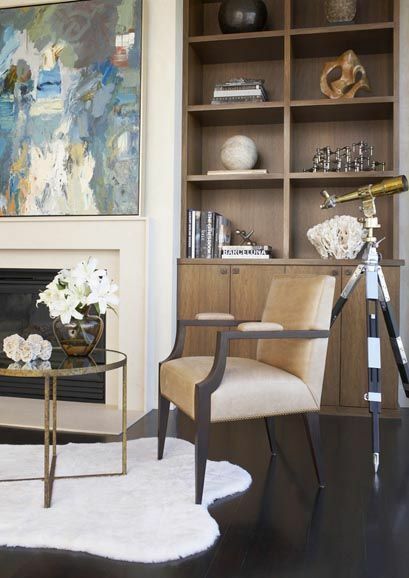 Spheres are a strong element in both architecture and interior design. If you notice in the home on Peachtree Battle that was designed by Stan Dixon and built by Benecki Homes, all the iron attachments on the stair rail are small iron balls that echo the larger wood balls used by Betty Burgess in her design. About 20 years ago, terracotta spheres were popular for placement in gardens. I bought several of them with varying degrees of patina and have placed them around my house - on my dining room table, on one of my mantels and in an antique wire potato basket on the floor. I really enjoyed this post. Sometimes we don't notice the simple details that make a composition so interesting! I too loved that Schrader spread in Veranda! Fabulous! beautiful blog. youve inspired me! Love the spheres!! I will be looking out for one. Great post! I have collected spheres for years and have them as accents all over the house, usually on top of a stack of books. My favorite is a bronze crystal sphere with wild animals in black bas relief along the diameter. Hi Holly...you are right they are everywhere. They can be easy to miss but it adds just that one more element/layer to make a room or space interesting. Enjoyed seeing all the beautiful examples, and they work well with any style room. Hope your fall is off to a great start! I have a number of concrete spheres that I have both inside and outside my home (interesting enough they're from Atlanta). I think you are so right about the calming effect they have on a room. They're perfectly balanced and they help a room feel more that way. Looks like the mercury spheres may be sitting on rings...? Very nice post! Never thought of spheres as being such an important design element... The pics here are lovely! Design comes full circle!!! I love spheres and I love how you showed them in so many different styles of decor. Hope you are having a wonderful September, with the kids back in school and getting ready for Fall!! I love using sphere's in design. What a wonderful idea to do an entire post about them. Lot's of inspiration here! I really enjoyed this post! I have 3 small spheres I use on various surfaces and one very large one in my small foyer that has an amazing presence that draws your eye up to the shelf it sits on. I also have 2 large zinc spheres that are so big, that they are best suited for outdoors and sadly have been in the basement of late. I have used them in projects, but not as much as I could have based on these fantastic images! I think the appeal is that they seem to have a magical quality and rooms almost always could use something in them without hard edges.